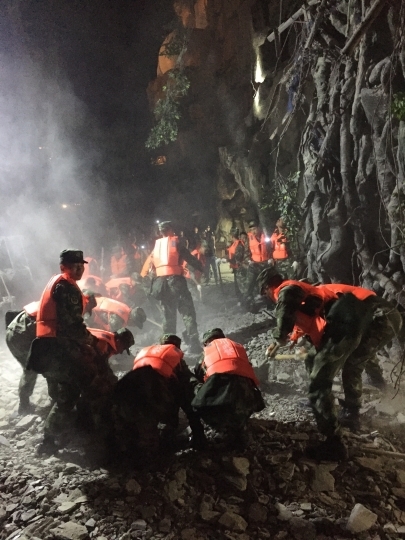 BEIJING — A strong earthquake shook a mountainous region in southwestern China near a famous national park, killing 13 people, injuring 175 others and knocking out power and phone networks. At least five of the dead were tourists, China's official Xinhua News Agency said. At least 28 people had serious injuries, according to the Aba prefecture government in Sichuan province. Chinese President Xi Jinping called for rapid efforts to respond to the quake and rescue the injured. Authorities sent medical teams, rescuers and other resources. The quake around 9:20 p.m. Tuesday struck a region bordered by the provinces of Sichuan and Gansu. The area is on the edge of the Tibetan Plateau and home to many Tibetan and other ethnic minority villages. It's also near Jiuzhaigou, or Jiuzhai Valley, a national park known for spectacular waterfalls and karst formations. The U.S. Geological Survey said it was magnitude-6.5 and just 9 kilometers (5.5 miles) deep, while the China Earthquake Networks Center measured the earthquake at magnitude-7.0 and said it struck at a depth of 20 kilometers (12 miles). Shallow earthquakes tend to cause more damage than deeper ones. A man surnamed Song who answered the phone at a local emergency office in Aba prefecture, where the Jiuzhaigou national park is located, said the nearby town of Zhangzha reported the deaths and injuries. Song did not say where the five tourists who died were from. The epicenter was about 39 kilometers (24 miles) from the county of Jiuzhaigou, which has a population of around 80,000, and was 285 kilometers (177 miles) from Chengdu, the densely populated capital of Sichuan province, according to the Chinese quake center. Xinhua said strong tremors could be felt in Chengdu. The Sichuan provincial government's news website said that after the quake struck, a number of train services to Chengdu and other cities were suspended. Jiuzhaigou county had a massive power outage following the quake, Song said. Local officials were being sent to the town of Zhangzha, which was closest to the quake's epicenter. "The tremors were very strong," said a woman in Jiuzhaigou town who gave only her surname, Wang, and said she worked for a travel company. She said the damage in the town center seemed minimal other than the suspension of electricity. "People from other regions are a pretty frightened," Wang said. Xinhua said more than 30,000 tourists at Jiuzhaigou were relocated to safety with help from tourist buses and private vehicles. Yu Qian, a local taxation bureau official, told Xinhua that she felt strong shaking that sent her and her two children rushing from their home on the fifth floor. Yu said the quake cut off power in her neighborhood and disrupted telephone service. 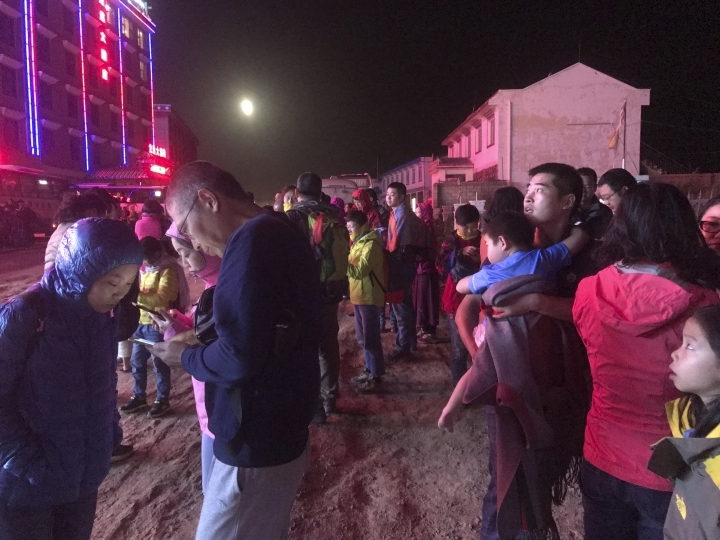 "I was getting into a car at the time of the quake, and it felt like a heavy-duty truck roaring past," said Liu Yanrong, a local township official, told Xinhua. Xinhua cited a worker at the Jiuzhaigou park named Sangey as saying that some houses in the tourist site collapsed or cracked following the quake and that authorities were organizing evacuations of residents. Images on Chinese social media sites showed rocks scattered on roads and people running out of bars and cafes in Jiuzhaigou town onto the street. A report on the news site's official microblog also cited Zhao Wei, the party secretary of the Communist Youth League's Jiuzhaigou division, as saying some telephone communications networks were down, making it difficult to determine the scale of the damage. On Wednesday morning, another strong earthquake struck in far northwestern China, some 2,200 kilometers (1,360 miles) away. It was measured at magnitude 6.3 by USGS and 6.6 by China's agency and was in a sparsely populated area of the Xinjiang region near the Kazakhstan border. There were no immediate reports of casualties or damage. Earthquakes are common in China's west, although the low population density there often means casualties are low. China's deadliest earthquake this century, a magnitude-7.9 temblor, struck Sichuan province in May 2008, killing nearly 90,000 people. Associated Press writer Louise Watt and researcher Fu Ting contributed to this report.